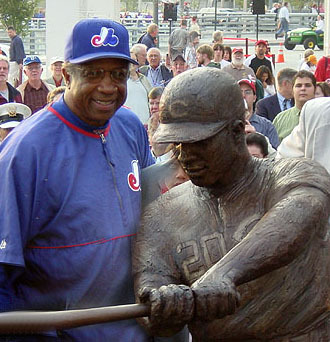 When the Cincinnati Reds dedicated their new home – The Great American Ballpark – on March 31st 2003, one of the team’s all-time greatest players, Frank Robinson, was on-hand to witness the unveiling of larger than life bronze statues of himself, as well as Crosley Field-era players (Joe Nuxhall, Ernie Lombardi, and Ted Kluszewski). Editor’s Note: Years later, on July 17, 2007, “Junior” passed Robinson to take sole possession of sixth place on the all-time home run list with 587 homers. 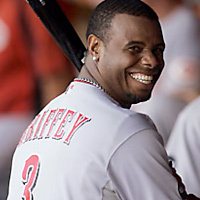 He finished the ’07 season with 593 home runs. The statues animate the 50,000-square-foot Crosley Terrace, a tribute to Crosley Field, which was the Reds home from 1934-'69. The terrace contains about an acre of concrete, which is landscaped with grass and trees that resemble a playing field. The "infield" contains a pitcher's mound built to Major League Baseball dimensions of the day, and grass in the terrace is sloped at the same incline as the infamous Crosley outfield. The four Cincinnati Red honorees were chosen in voting by fans, who were asked to select one catcher, one pitcher and two hitters. The Reds received more than 17,000 ballots cast through the Internet and at Cinergy Field. 500 Home Run Club member Frank Robinson (hitter), along with Ted Kluszewski (hitter), Ernie Lombardi (catcher), Joe Nuxhall (pitcher) received the most votes. The statues, which were sculpted by local artist Thomas Tsuchiya, were phased into the terrace one at a time throughout the season. Special lighting illuminates the statues, stone benches and a 60-foot stone sculpture meant to depict the romance of the game are also in the Crosley Terrace. Located adjacent and connecting to Great American Ball Park along Main Street is the Reds Hall of Fame Museum and team store.